Memory and retention research shows that people only remember about 10 percent of what they hear just one week after hearing it. However, according to a 2006 study, retention jumps to 65 percent when a picture was associated with the key messages being delivered. The rise of memes, infographics, and videos in content marketing means you most likely already understand the need for effective content marketing visuals to aid brand storytelling. But, are you just as informed about what makes visual content effective? How do you make sure your images help to drive actions, rather than just conveying information? And how can you create visual content that challenges your audience to do something different, instead of just saying they “like” it? The old brain doesn’t have the capacity for language, so it needs pictures to help it wake up and decide to do something different. At the same time, the old brain is a very basic mechanism — like an on/off switch — so your pictures need to be very simple. Also, you must remember, the old brain is a component of your brain’s survival mechanism, so your visuals need to make the status quo feel “unsafe” to that survival instinct in order to make it receptive to your message of change. Context: Your prospect needs to see their current status quo as unsafe, so, your picture can depict the gaps and deficiencies in its current state that makes it unsustainable, thus requiring a new approach. People respond when they are in deficit, so you have to first set a context that creates a sense of urgency to change. Don’t just show your solution and describe why it’s great and expect them to leap at the new opportunity. Contrast: Your image should show a clear contrast between the status quo solution and what you are offering. Contrast is required to help the brain determine the virtues of your solution and make a decision. There is no value perceived if there is no contrast. Depict this “to and from” by showing, specifically, how your new approach can help to fill the gaps and overcome the deficiencies of the existing solution. The best visuals put the current situation, and its problems, literally side by side with the proposed alternative and its remedies so the contrast is clear and value can be visually discerned. Concrete: Simple, concrete visuals tell your prospect’s old brain that an alternative solution exists and offers benefits, while complex and abstract visuals confuse the brain and paralyze it from making a decision. By using illustrative imagery like numbers, arrows, stick figures, shapes, and icons, you are translating a potentially complicated concept into an approachable, understandable option, which helps to ease the decision-making process. Context questions: How does the video tell a visual story about why an institution needs to take another look at how they are handling “mission critical” data? And, how does it position the status quo approach as being “unsafe”? Contrast questions: How does the video portray the “to and from” — showing the status quo approach in contrast to an alternative approach? How does it visually create contrast that highlights the virtues and value of the alternative? The difference and choice becomes viscerally clear with a simple visual to highlight the vices of the “from” scenario and the virtues of the “to” option. Concrete questions: How does the video make a very complicated concept appear reasonable and doable? Where are there links between the proposed alternative to something familiar and successful to make the change request appear simple? Context answers: Traditionally, first responders use a private network for their voice communications, but public networks were used for their data, such as video and photographs. To communicate the urgency of their changing over to a private network for both data and voice, the video portrays the status quo approach as being unsafe — i.e., because first responders’ data is co-mingled with the public’s data, important emergency communications may be put at risk if those public networks become compromised. Contrast answers: The video shows a clear contrast between the chaos and concerns created by the public network and the protection and peace-of-mind provided by the private network alternative. The difference and choice becomes viscerally clear with a simple visual to highlight the vices of the “from” scenario and the virtues of the “to” option. 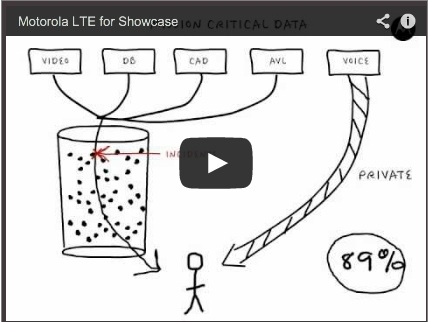 Concrete answers: The video uses a simple, hand-drawn visual story to describe the complexities involved in data communications, first responder information requirements, and the pros and cons of public versus private networks. It also makes a link between the proposed alternative to something very familiar and successful to make the change request appear reasonable and simple. Next time you are creating visual content for your marketing campaigns, remember the three Cs and you’ll be on your way to more effective and successful interactions with your prospects. Is brand storytelling a priority for your content marketing strategy? You’re not alone. Check out Building the Perfect Content Marketing Mix to see which tactics content marketers are adding to their mix this year. With more than 20 years of marketing and sales experience, Tim Riesterer, Chief Strategy and Marketing Officer at Corporate Visions, Inc., is a recognized thought-leader, practitioner and author regarding marketing and sales messaging. Tim's books, Customer Message Management and Conversations that Win The Complex Sale focus on increasing a marketing department's impact on selling by providing sales-ready messages and tools that salespeople can use to create a compelling story that wins more deals.